(*) Asbestos in Playskool crayons sold at Dollar Tree. Asbestos, which can cause lung cancer and mesothelioma, has recently been found in other children’s products, such as makeup. (*) Lead in recently-recalled children’s water bottles (Base Brands children’s Reduce Hydro Pro Furry Friends water bottle, once sold by Costco, and GSI Outdoors children’s water bottle, once sold by L.L. Bean). The Consumer Product Safety Commission recalled both of these items because they contained high levels of lead. Lead can cause severe developmental and behavioral problems. (*) Phthalates in Jot brand blue 3-ring binder. 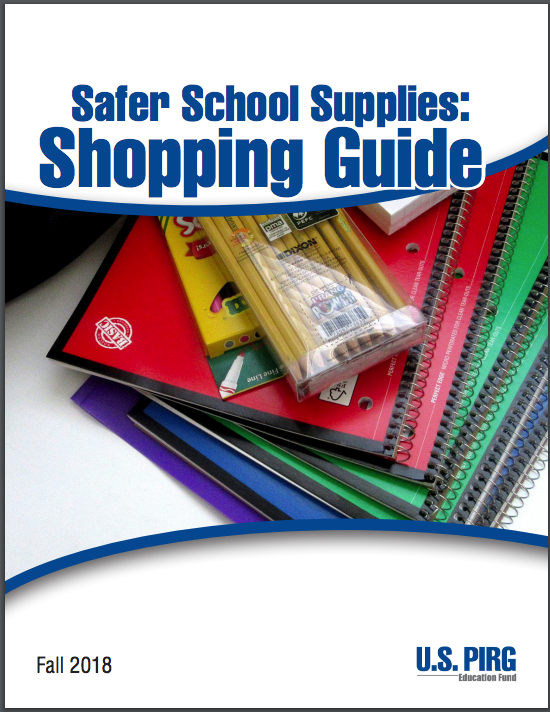 The levels of phthalates in the binder is considered unsafe for children by the Consumer Product Safety Commission. High levels of phthalates can lead to birth defects, hyperactivity, and reproductive problems. (*) Benzene in Board Dudes brand markers. Benzene is a known carcinogen linked to leukemia, and disruptions in sexual reproduction and liver, kidney and immune system function.